By far the runaway most popular barbecue item of this year! Has falafel been on TV or something? You have to serve them with hoummous to get the whole experience. We had to make extra for every barbecue we served because those naughty meat eaters wanted to eat them too! Used the Ottolenghi recipe from his Jerusalem book. I remember the first time we ever tried making them in 2007, and every attempt kept disintegrating in the deep dryer till we gave up in rage. The trick, as it turns out, is to keep pulverising the raw chickpeas in the food processor till they come together in a ball in your hands. When it's ready, you just know. You just have to keep practicing! It's worth it though - the homemade ones taste about 10 million times better than anything you can buy. Also nice with tatziki - who needs meat?! 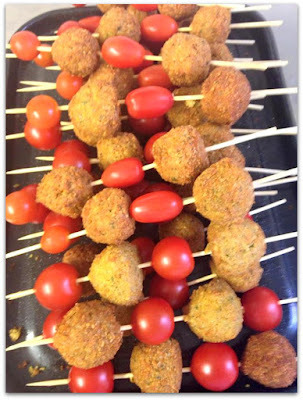 Leave a Comment barbecue, barbeque, falafel, houmous, kebabs, vegetarian.